Hailing from Fairbanks, Alaska, senior Shannyn Bird knows a bit about getting out of her comfort zone. As a senior in high school she knew that she wanted to find a university with a strong research background and a tight-knit community, and knew she'd have to leave home to find it. 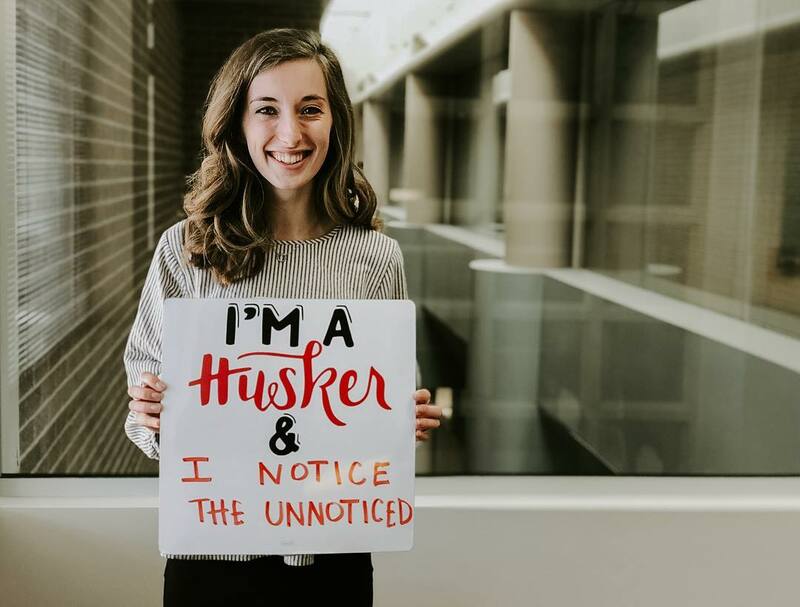 Though it was a scary step to take, she packed up and moved more than 3,000 miles away to study at the University of Nebraska–Lincoln. "If I had stayed in Fairbanks," Shannyn said. "I would definitely not be the same person I am now." Shannyn knew she had to set her own path, and that's something she's stuck to throughout her time at the university. Though she studies biochemistry and math, she isn't applying for a medical school program like most of her classmates. She wants to study law, something she got unique experience in as an Alaska youth court participant. Shannyn spent five years processing and sentencing low-level juvenile misdemeanor cases with other youth attorneys, judges and jurors under the supervision of practicing attorneys. This experience, coupled with the realization that she didn't want to work in a lab, made her decide to pursue a career where she could intersect her strengths. Shannyn hopes that when she is finished with law school she can pursue both her passions through environmental or scientific policy law. Though it's a different path than most of her classmates, it's her own — and that's one of the most important things she's learned. From her time at Nebraska, Shannyn has learned to find her own happiness and pave her own way. "I think that just having that inner sense of self is really important." Shannyn said, "Now I feel that the place I am doesn't determine who I am, I determine my sense of happiness." For a handful of University of Nebraska–Lincoln students, spring break was filled with drywalling, painting and picking up the pieces left in the aftermath of Hurricane Harvey. A group of volunteers from UNL Lutheran Chapel made their way to Corpus Christi to take part in the relief efforts still needed after the Category 4 hurricane hit the coastal town in 2017. 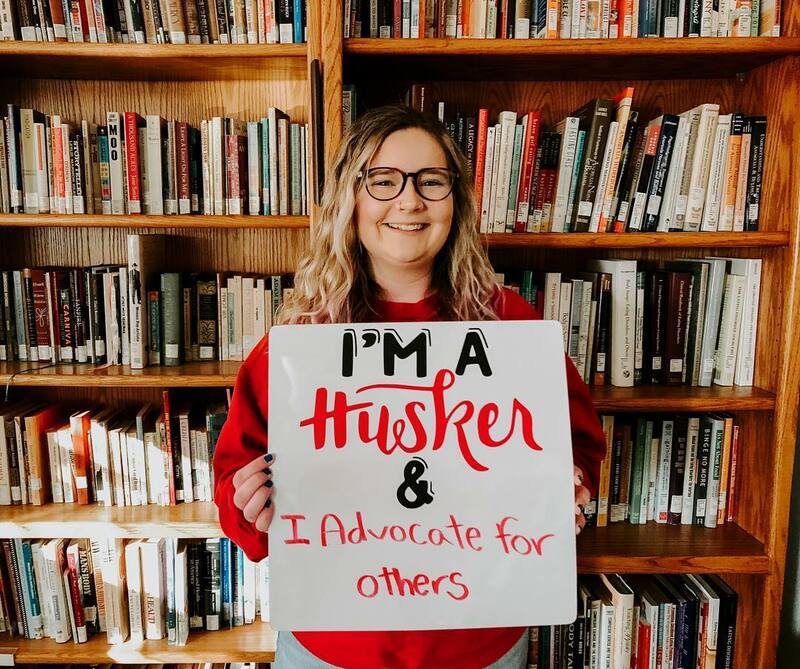 Spring break mission trips are common for the UNL Lutheran Chapel, and this year's service opportunity was led and planned by junior psychology student Kaitlin Buhler. While it wasn't Kaitlin's first mission trip, it was her first time using her spring break to give back. She said she sees the trip as a special chance to contribute to something bigger than herself. As a college student, she said she'd been given responsibility and independence when planning where the group would be volunteering. Kaitlin made contact with a Texas group and was able to find the communities that were most in need of assistance and the tools that her team could use to help them. While a lot of cleaning out has happened in Corpus Christi, Kaitlin said there's still work to be done to get people back into their homes. Kaitlin hopes that the group's efforts have helped some of the hurricane victims return to normalcy, and that having been helped to get back to their homes they will be able to help others in the future, too. Growing up on the Winnebago Reservation in northeast Nebraska, Colette Yellow Robe dreamed of pursuing an advanced degree. But after graduating from college with a bachelor's degree in sociology, she hit a wall. She couldn't find work, so she took a job in interior construction to make ends meet. While spending her days building walls and shelving, she had a moment of clarity. “I didn’t do all this schooling and sacrifice to do construction,” she thought, “I have to get myself going.” Colette balanced being a single mother, teaching assistant and research assistant all while working towards her PhD. When she was offered her current job as assistant director for non-cognitive development and leadership for the university’s TRIO Programs, a mentor warned her that she needed to put her education first. Colette took the job, and her mentor seemed to be right. Life kept moving. She got married. She had another child. Her father became ill and died. Her husband asked for a divorce as she was two chapters into her dissertation. Though all this may have slowed her down, Colette never let it stop her from achieving her goal. When she completed her PhD in educational psychology in 2014, her mother suggested that she re-adopt her tribal name and become Dr. Yellow Robe. By changing her name to reflect her Native American heritage, Colette found a source of strength to help her carry on. “Sometimes you have to do things for a reason,” Colette said. “It’s absolutely the grit and the glory. We have to learn things the hard way — but we persevere." 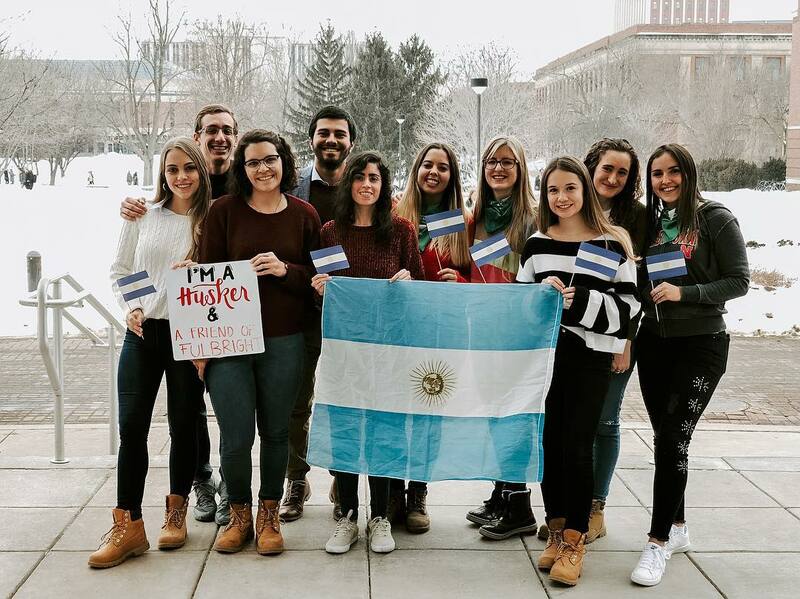 For the past six weeks, campus was home to 10 new students from Argentina. As part of the Friends of Fulbright program sponsored by the Fulbright Commission Argentina and the U.S. Embassy in Argentina, the cohort observed classes, strengthened their English skills and fully immersed themselves in American culture. 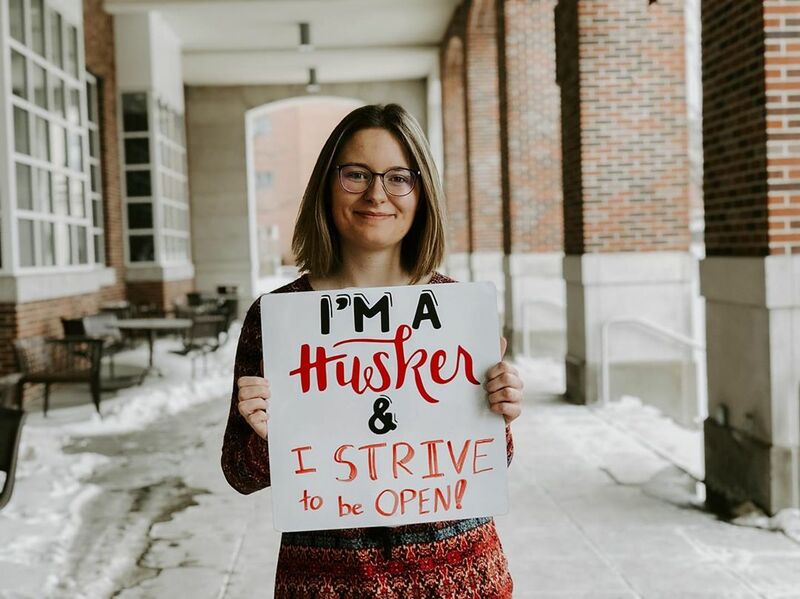 From living in the residence halls to attending labs and lectures, the students lived their six weeks on campus as any other University of Nebraska–Lincoln student would. They explored local coffee shops, took part in classes in their majors, and even experienced fraternity and sorority life. Though at first unsure of how conversations would go with American students, the Argentine students found everyone was warm and welcoming. The students say that university life in the U.S. is much more community focused than in Argentina. They also said that being a part of the Friends of Fulbright program has allowed them to see a mix of culture and ideas, and make new friends from all over the world. They head back to Argentina on Saturday, and while their time in Nebraska might be over, they'll always have their memories (and new Husker apparel!) to remind them of their experience. ¡Buen viaje! Michaela loves hearing other people's stories. In fact, she loves them so much that she's dedicated to helping others be able to tell their story in their own voice again. As a student studying speech-language pathology, she hopes to help people be able to communicate again through speech therapy. While on a mission trip to India, she saw the impact of the lack of speech therapy in children's lives. She saw how it changed them as a human and wanted to show that someone was listening to them. After her experience in India, she decided to do independent research on the impact and strengths of speech therapy in developing nations and even traveled to Uganda for an internship at a hospital there. She continued her research upon her return to Nebraska and hopes she can pursue it through graduate school. Her research wasn't just something she did to liven up her resume. For Michaela, it was an opportunity to grow into the kind of speech therapist she wants to be — someone who listens to those who are unheard and is there to help. When Justice started college at the University of Nebraska–Lincoln, there was one thing missing: hockey. She had played for years back at home in New Jersey and it didn't make any sense to her why a university as big as Nebraska wouldn't have its own active women's team. She found out that there used to be one, but it had dissolved after a few seasons. So, Justice decided to bring women's hockey back on campus. It wasn't easy. She tried to gather names of interested members during her freshman year but only came up with five. During her sophomore year, she started to put out the message again. This time, Justice had ten interested players and began to search for coaches. 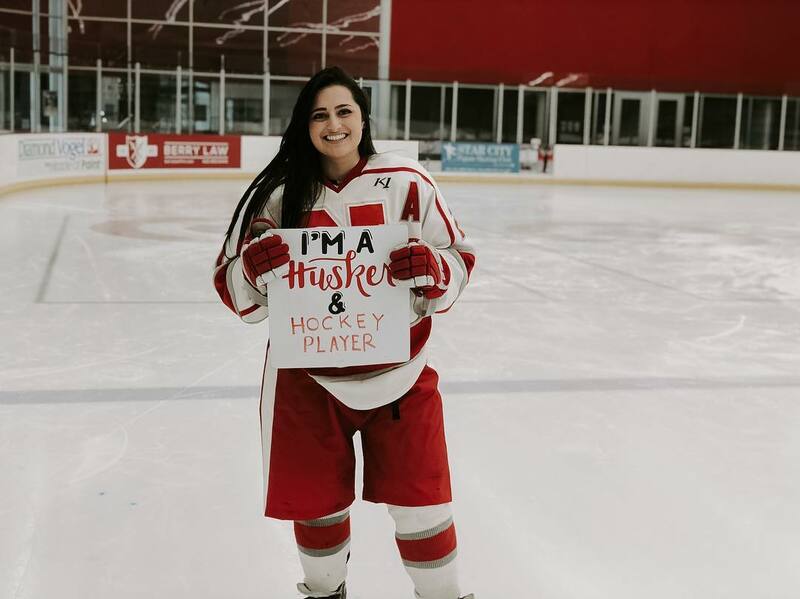 By the spring of 2017, the UNL Women's Hockey team was approved as an official sports club. They joined the American Collegiate Hockey Association and squared off against 17 other college teams during their first season. The team is open to all players that are ready to lace up their skates and go — even if they've never played before. For Justice, bringing women's hockey back on campus was about more than just getting back on the ice. She saw that there was a men's team and wanted women players to get the same chance to play. "Not having that same opportunity for women is kind of tough," Justice said. 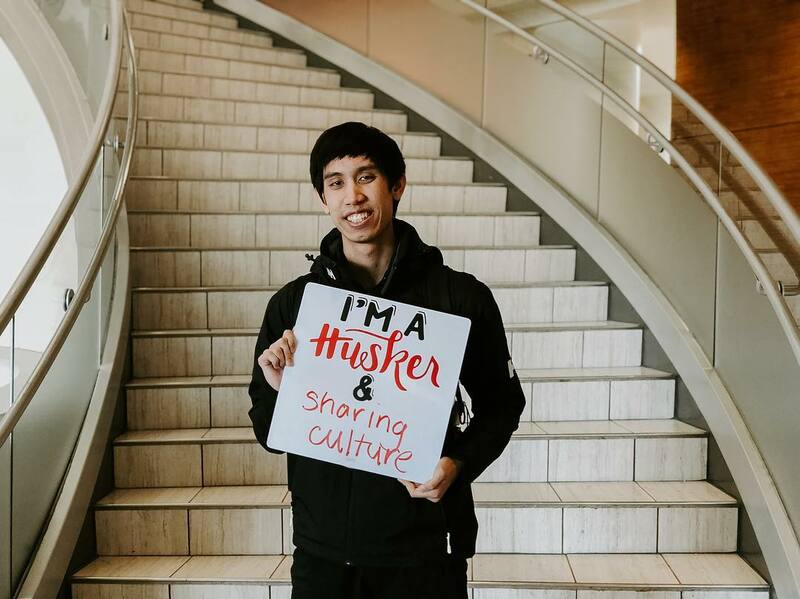 For Brian, being a member of the UNL Vietnamese Association (VSANE) gives him a voice. It's a voice that is heard in the large Lincoln Vietnamese community, but also a voice he uses to teach other students about a vibrant culture. One way he's doing that is by serving as the chair for VSANE's "Hello Vietnam: A Ticket to Childhood." The event is the RSO's biggest fundraiser of the year and features local Vietnamese food, dancers, singers and more. Brian says it's an important event for the university community, because it gives students the opportunity to experience the culture for themselves. "It's just important to see a different outlook or perspective." Brian says. "Hello Vietnam" is this Saturday and will reflect on the past and present experiences of growing up in the Vietnamese community. Some of the story is based on a popular novel from Vietnam, but Brian says a lot of it is based on the life experiences of VSANE members. Brian says that VSANE, as well as "Hello Vietnam," isn't exclusive to only local or international Vietnamese students. Any student interested in learning more about the culture can join the RSO or attend the event. When Sydnie was 16, her life was punctuated by rounds of chemotherapy and hospital room stays. With her energy zapped and her immune system weakened, seeing friends and socializing with other teenagers became a special occasion rather than a normal part of her day-to-day life. Then she learned about Dance Marathon. Dance Marathon raises money for Children's Hospital & Medical Center in Omaha and culminates every year in a 12-hour event where patients and their families are invited to come to Nebraska's campus and be celebrated. The event gave Sydnie the chance to take a break from her hospital room and spend the day with students close to her own age. After a full day of socializing in the family room and watching the dancers bust a move, Sydnie was able to see how many people cared about the hospital that had become her second home. Sydnie was a Miracle Child for Dance Marathon for two years. Now, having been out of chemotherapy since her freshman year, Sydnie dances for the kids. 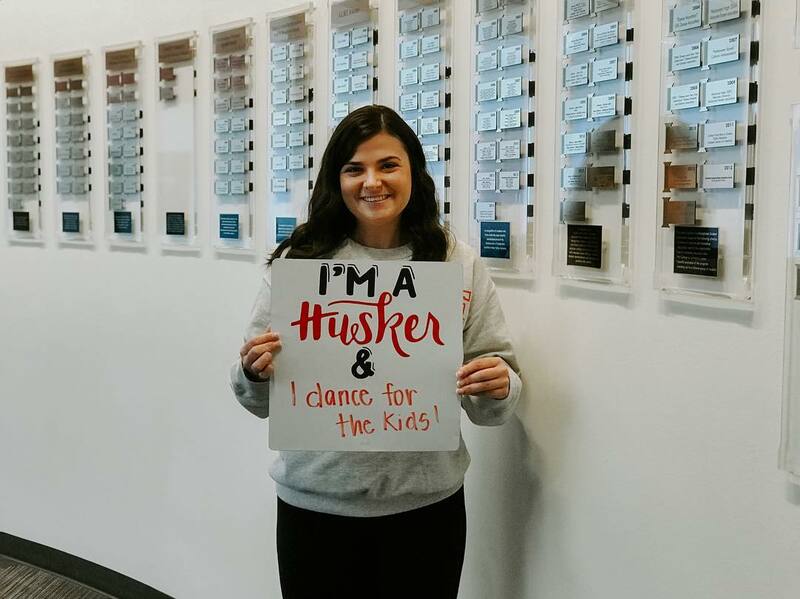 At Dance Marathon's HuskerThon 2019, she'll be dancing for the kids she met while she was at Children's Hospital and for all of those who are still there. At a time when most people in Lincoln are sleeping, Jesse Esquivel is waking up and getting ready for the day. The full-time student usually wakes up early to be ready for work at 4 a.m. and then heads to class. 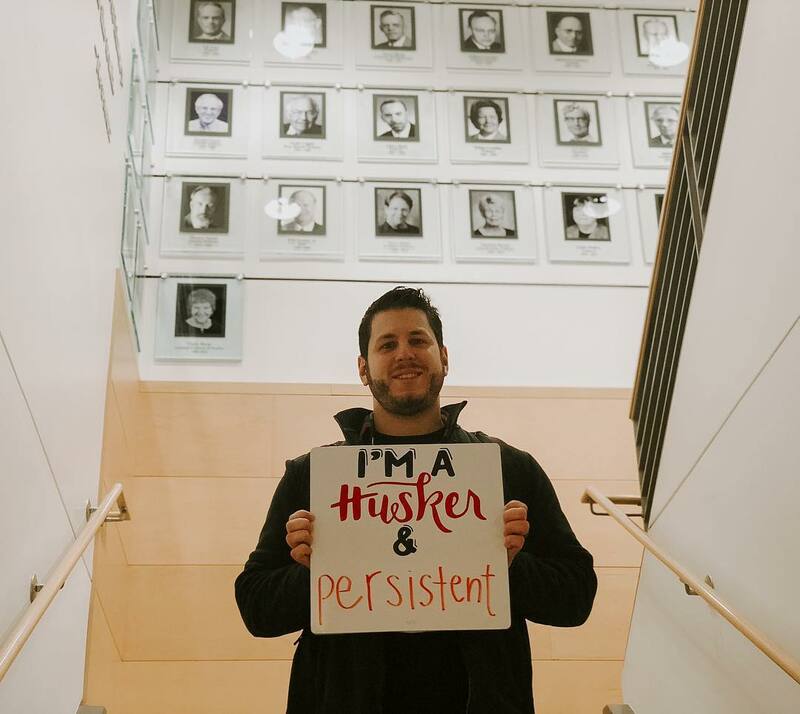 When he isn't studying at @unlcojmc, he can be found attending meetings and brainstorming with UNL PRSA. For Jesse, it's worth it — he wants to be here, and he wants to do this. When he started classes in fall 2018, he saw award trophies on display in Andersen Hall. He decided he wanted one. Last month, the work he and PRSSA did for their Huskers Helping Huskers Pantry+ campaign earned a Nebraska PRSA Paper Anvil Award. He doesn't let the early hours hold him back. He told his dad he would get his degree, and after enrolling at Nebraska at 32, he's on his way. He says he feels welcomed by the Nebraska community and wants other non-traditional students to not be afraid. Jesse says that if they want it, they should go for it. Though she isn't a parent herself, Lauren Gehrki puts her heart into helping Huskers with little ones. As the coordinator for Students with Children, she helps plan events and cultivate the community of student parents on campus. 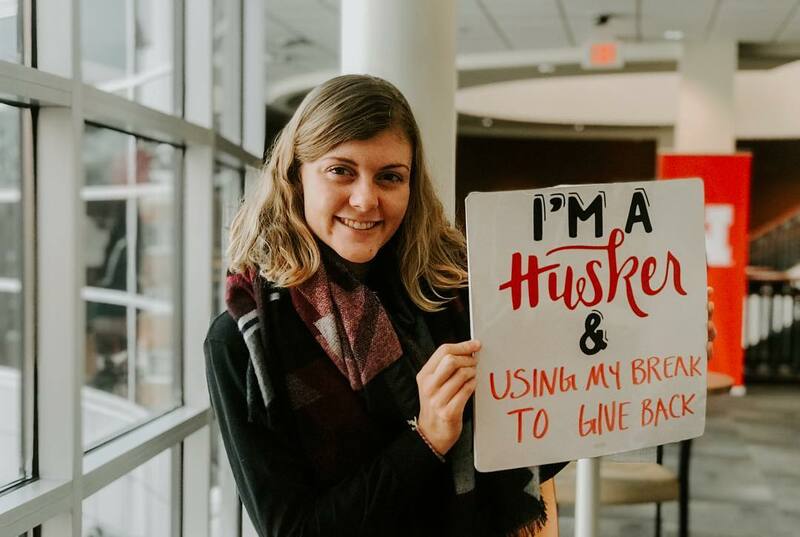 In December, Lauren organized the first Holidays for Little Huskers event. Students with children applied and listed their wants and needs, and faculty and RSOs "adopted" them to support their holiday wishes. From warm winter clothes to child-size sleds, a variety of gifts were shared with the seven sponsored families during their busy finals season. Lauren hopes to continue to raise awareness of the resources available to student parents. 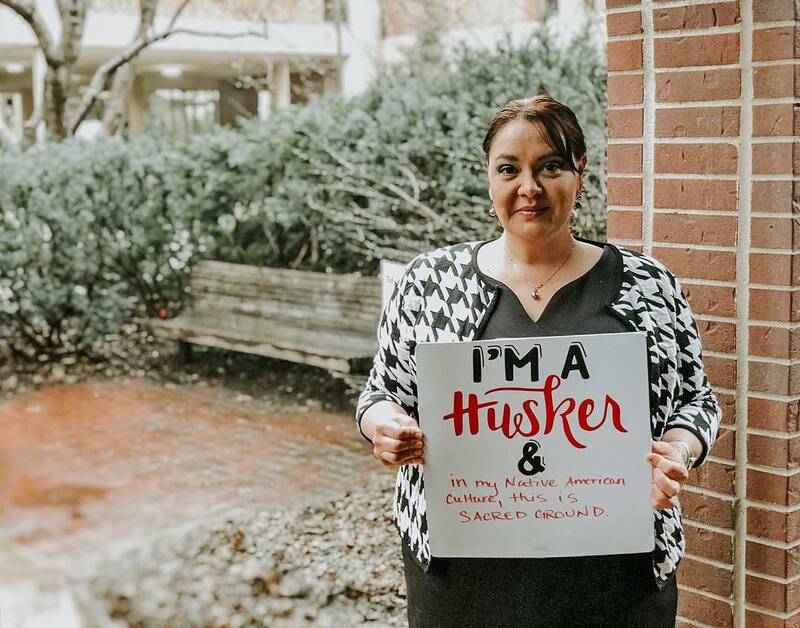 No matter their level of need, any Nebraska student parent is welcome at the Students with Children RSO and can participate in their events. The group meets every Monday and discusses programming, resources and advocacy opportunities for students with dependents. Lauren believes that someone shouldn't have to stop their education to pursue having a family, and she advocates for her classmates with children.